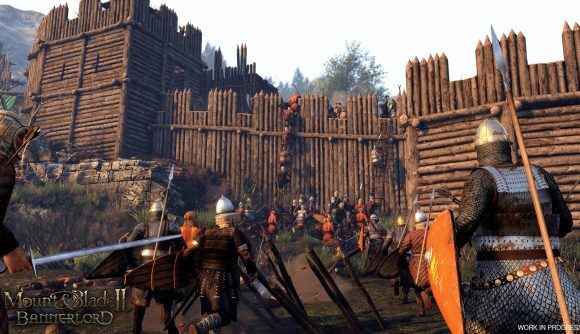 One of the most exciting features we’ve seen for Mount & Blade II: Bannerlord is its siege battles, which involve hundreds of troops storming into medieval castles as catapults and siege towers assault the walls themselves. But a new developer diary says this will just be the initial stage of some sieges. Bigger, upgraded castles will have keeps, where defenders can rally to try to fight off the invading army in a last-ditch fight for their lives. Once castles have been upgraded in Bannerlord, they become harder to capture. Simply breaching the castle curtain and taking up positions inside isn’t always enough to declare victory – defenders can in some cases retreat back to the fortified keep. TaleWorlds says this is when the final phase of the siege kicks in, and the effect is to somewhat level the playing field. Where the initial siege depends largely on the troops and equipment present, the last stand battles let the game’s skill-based combat system shine. Defenders are assumed to have time to construct hasty barricades with tables and chairs available in the lord’s hall, and the corridors and indoor architecture will make these last-ditch fights brutal, hand-to-hand affairs. “Think the Red Wedding, but with more red and less wedding,” the developers write. We’ve been looking at Mount & Blade II: Bannerlord sieges for a while – here’s the footage TaleWorlds showed off at Gamescom in 2016. Interestingly, TaleWorlds has decided to use a respawn mechanic for these late siege phases, rather than try to push hundreds of NPCs into a scene at a time. This is due to the constrained spaces of the keeps, and the developers say it helps makes sure gameplay remains fun – you need some room to be swinging your sword around, after all. Alas, TaleWorlds has not announced the Mount & Blade II: Bannerlord release date yet. That means I’ll be getting my medieval command fix from my heavily-modded copy of Warband for a while longer.